In southern Israel, on the western edge of the Judean desert lies the Dead Sea – a hyper-saline lake which is also the lowest point on Earth. This is, without a doubt, one of the must-visit places during your trip to Israel. While Tel Aviv offers vibrant nightlife, endless restaurants, and a stunning coastline, the true natural beauty of Israel is found not in the cities, but in its deserts, hills, and nature reserves. The Dead Sea is perhaps the most remarkable body of water in the world. The high salt concentration makes your body more buoyant and allows you to float effortlessly across the water, and the Dead Sea floor contains mineral-rich mud which provides tremendous benefits for your skin. Getting to the dead sea from Tel Aviv via public transport is very straightforward. The no.421 bus from the Tel Aviv bus terminal (more commonly known as Arlozorov Terminal) departs twice daily at 9 AM and 12 PM. Reservations can be made using the Egged website, up to 14 days in advance. In addition, there is also the option of a private shuttle bus, guided dead sea tours, and taxis. For more information and reviews, please see TripAdvisor. However, if you have the means, travelling from Tel Aviv to the dead sea by car can be an unforgettable experience. This is our recommended method of travel to the dead sea as it offers the most independent journey. Along the way, you will encounter plenty of natural landmarks, archaeological digs, nature reserves, and historically preserved sites. By car, the journey takes approximately two and a half hours, so we advise that you leave Tel Aviv early in the morning so that you have plenty of time for stop-offs along the way, and still arrive at the dead sea long before sunset. 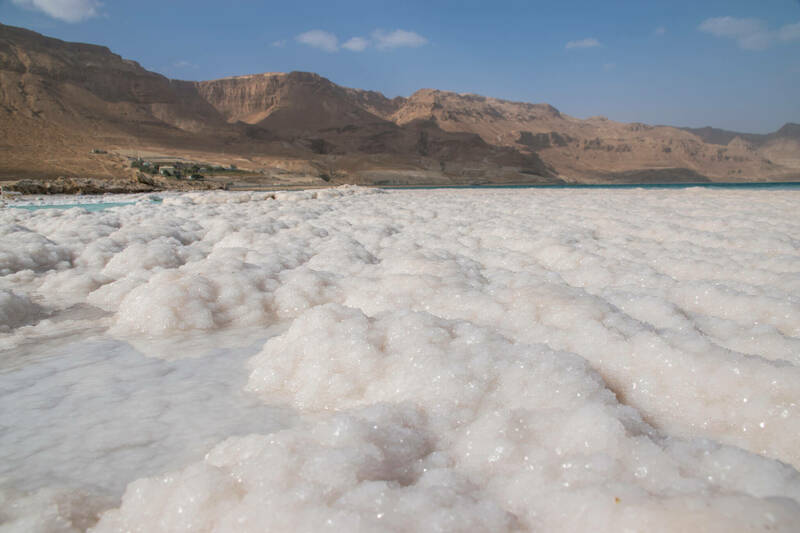 Here are a few places that you should visit while travelling from Tel Aviv to the dead sea. Please, keep in mind that some attractions can be closed or have limited access on Friday and Saturday, so make sure to check opening hours beforehand. The first portion of the journey is between Jerusalem and Tel Aviv, lasting approximately 45 minutes. Afterwards, as you continue South, beyond Jerusalem and past Maale Adumim, you will enter the breathtaking Jericho Valley. Here, the road winds between golden desert hills, and its one of the most scenic views in the entire country. There are several small settlements along the road, each offering places to eat, relax, and enjoy the warm desert climate. These include Mitzpeh Jericho, Kalya, and Almog. As you continue South along route 90 towards Ein Bokek (the main tourist beach of the dead sea) you will reach Qumran National Park – home of the Dead Sea Scrolls. This is one the most prominent archaeological sites in the world, and visitors are given a remarkable insight into the Hellenistic and Herodian eras of ancient Israel. 35 KM south of Qumran is the Ein Gedi reserve – a desert oasis and one of Israel’s premier hiking spots. The reserve is a natural sanctuary for many animals, and several rare species of hyrax and ibex can be found here. In addition, the neighboring Kibbutz is home to an internationally acclaimed botanical garden, spread across almost 24 acres and containing over 900 species of plants. Bring water: The climate is hot and humid, and dehydration is a genuine concern. Make sure to pack plenty of water for the journey. Bring flip flops: The beach sand gets scorching hot, especially during summer. Be sure to bring flip-flops so you don’t burn your feet! Don’t go underwater: The dead sea is not the place to practice your diving skills. If the water gets into your eyes they will sting ferociously. Thinking of Visiting Jerusalem first? Here is some important information on how to get to the Dead Sea from Jerusalem!